As of Feb 1 2019, SNPP Sounder ATMS and CrIS Level 1 Version 1 production has come to an end, leaving a complete seven year record for the microwave and nominal spectral resolution infrared Level 1B products. These products have been superseded by their Version 2 counterparts, for which production is continuing. The Cross-track Infrared Sounder (CrIS) Level 1B Normal Spectral Resolution (NSR) data files contain radiance measurements along with ancillary spacecraft, instrument, and geolocation data of the CrIS instrument on the Suomi National Polar-orbiting Partnership Project (SNPP). The version-1 data should be considered a sample data set, which has been replaced by SNPPCrISL1BNSR version-2. 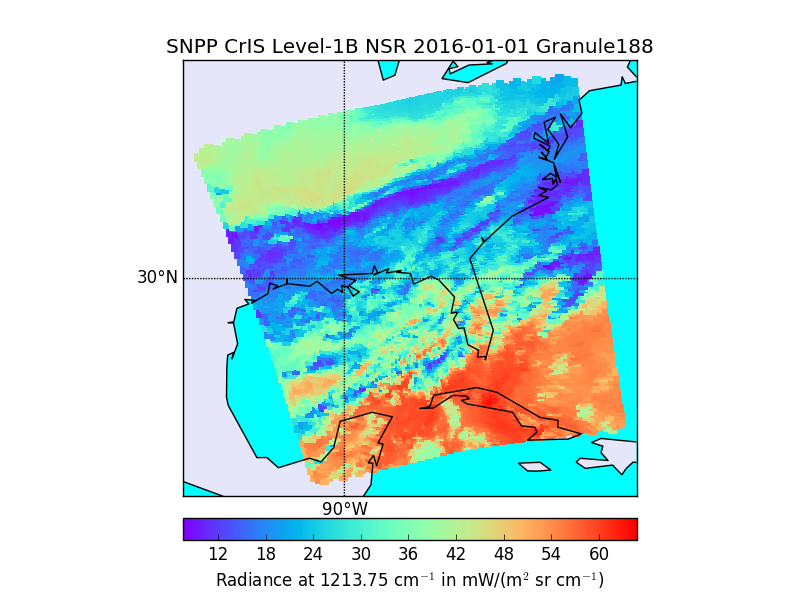 In December 2014, the CrIS instrument on the SNPP satellite doubled the spectral resolution of shortwave infrared data being transmitted to the ground. In November 2015, additional points were included at the ends of the longwave and shortwave interferograms to improve the quality of the calibration. Prior to November 2, 2015 the data are only available in Normal Spectral Resolution, after November 2, 2015 at 16:06 UTC, the data are available in both NSR and Full Spectral Resolution (FSR). The NSR files have 1,317 channels: 163 shortwave channels from 3.9 to 4.7 microns (2555 to 2150 cm-1), 437 midwave channels from 5.7 to 8.05 microns (1752.5 to 1242.5 cm-1), and 717 longwave channels from 9.1 to 15.41 microns (1096.25 to 648.75 cm-1). Each CrIS field-of-regard (FOR) contains 9 field-of-views (FOVs) arranged in a 3X3 array. The Level 1B files contain 30 FORs in the cross track direction and 45 in the along track direction. Data products are constructed on six minute boundaries. The radiance data are used for sounding observations needed to retrieve profiles of atmospheric temperature, moisture, and trace gases for civilian operational weather forecasting as well as continuity of these measurements for climate monitoring purposes. Joint Polar Satellite System (JPSS) Cross Track Infrared Sounder (CrIS) Sensor Data Records (SDR) Algorithm Theoretical Basis Document (ATBD). CrIS No campaigns listed. No dates provided.